With your help in 2010, we can launch a technology program that creates an ongoing mode of communication between refugees living in the camps and you and your community. CommKit, created by our team member Yuen-Lin after he visited the camps, is an all-in-one communications package that allows refugees in one of the most remote, unconnected areas in the world to send and receive videos, photos, and messages using satellites. 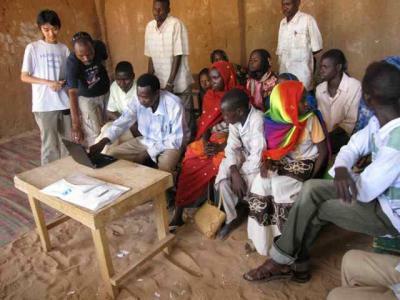 This year, Yuen-Lin was able to train several refugees on a prototype of CommKit. Watch the short video below to get a preview of the CommKit in action. They enjoyed it so much! Just like here, it was the younger generation who quickly understood the technology and was helping their teachers! By becoming an i-ACT Ambassador and making a monthly pledge, we can create this ongoing communication. Your valuable time and energy is spent building a new culture of participation here in the United States and in the largely forgotten refugee camps filled with Darfuris. You become connected and once you are feel this deep relationship, you are able to introduce your friends and family to Adam, Selma, Rahma and more. Through all these relationships, change begins. Are encouraged to share your relationship the relationship formed with Darfuris with your local community through informal conversations, events, presentations, and fund raising efforts. As an i-ACT Ambassador you are raising awareness and funds, but most importantly you are joining a community. Click here to become an i-ACT Ambassador.